The first “four-namer” (© Brad Gilbert) to make inroads on the WTA Tour since the singles days of Maria Jose Martinez Sanchez, 23-year-old Maria-Teresa Torro-Flor made history this week — a world away from the Caja Magica and the Foro Italico. With a 6-4, 1-6, 7-6 (6) win against Mariana Duque-Marino in the second round of the $50,000 event in Saint-Gaudens, France, Torro-Flor recorded her 32nd consecutive win on the ITF Pro Circuit, breaking a record that Casey Dellacqua held for nearly four years. The Aussie’s 31-match streak — the best in nine years — came across consecutive events in her home country in 2011, where she bagged six straight titles at the $25,000 level behind 27 straight-set victories. Dellacqua’s streak ended at the hands of Zheng Saisai when she returned to the ITF Tour in April of 2012. Granted, Torro-Flor’s winning streak doesn’t account for the fact that she didn’t compete on the ITF Pro Circuit in 2013 or 2014, when she was busy reaching a career-high ranking of No. 47, winning her first career WTA title in Marrakech and recording wins against Daniela Hantuchova, Garbine Muguruza and Angelique Kerber. Against Kerber, Torro-Flor cracked 60 winners, most off of her lethal forehand, to record her first top 10 win in Indian Wells in 2014. After struggling with injuries, Torro-Flor saw her ranking free fall as she won back-to-back matches just twice since claiming her first WTA title last April. 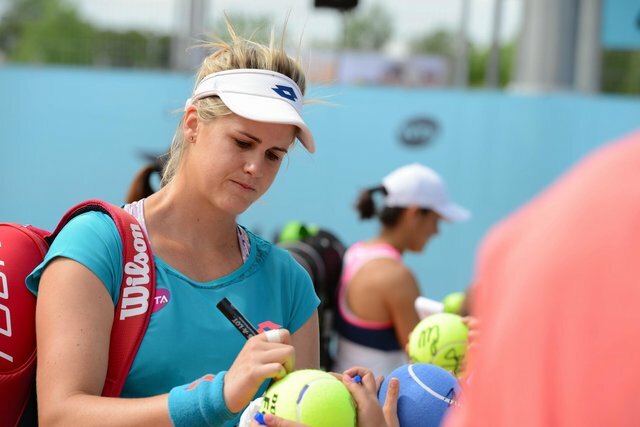 She returned to the ITF Pro Circuit ahead of the event in France ranked No. 164, over 100 places lower than where she stood exactly 12 months ago. A place where her booming forehand once dominated, the Spaniard picked up right where she left off. She left Saint Gaudens with a trophy, and her own piece of history. R32:  Heidi El Tabakh (CAN) – 6-2, 3-1 ret. That’s 35 – count ’em, 35 — consecutive victories, plus one walkover and one bye. Torro-Flor’s run of dominance includes winning 70 out of 78 sets played, and being pushed past six games in a set just six times. For Torro-Flor, the ITF Pro Circuit is “where everything started,” and it’s certainly the means by which the former top 50 player will try to return to her former heights. Torro-Flor’s road back to the WTA Tour might wind through the minor leagues for a little while longer, though; while the title in Saint Gaudens boosted her ranking by 30 places, she heads to Roland Garros with a third round showing to defend. It was a big week for the ATP’s next generation on the Challenger circuit as Thanasi Kokkinakis and Alexander Zverev picked up titles, while Chung Hyeon’s bid to win three straight titles fell just short. Kokkinakis never should’ve been in Bordeaux, but because of an untimely airport fire, the Aussie ended up entering the event after he was unable to make it to Rome on time. Because he entered late, the 19-year-old competed in the qualifying draw in the French city, eventually advancing to the final with the loss of just one set. In the final, Kokkinakis needed five match points, but he eventually came away with his first Challenger title when he defeated Thiemo de Bakker, 6-4, 1-6, 7-6(5). Zverev and Chung had mixed success on home soil. In Heilbronn, Zverev won his second career Challenger title with a 6-1, 7-6(7) win over Guido Pella, while Chung’s bid for a third consecutive crown was foiled by Go Soeda, 3-6, 6-3, 6-3 in the Korean capital of Seoul. All three teens head to Roland Garros this week, as Chung and Zverev are the top two seeds in qualifying while Kokkinakis is the beneficiary of Tennis Australia’s wildcard. While Torro-Flor was making history in France, Teliana Pereira also made a name for herself — for all the wrong reasons. The Brazilian, who became the first from her country in 27 years to win a WTA title earlier this year in Bogota, was disqualified from her quarterfinal match against Jana Cepelova when she sent her racket flying into the crowd following the end of the first set tiebreak. Pereira, who had held set points earlier in the set, seemingly hits a ball in anger. Her racket slips out of her hand and goes flying as a result. While Pereira might not have meant for her racket to fly into the stands, the result of the action of hitting a ball in anger is what makes the action worthy of a default. She later posted a heartfelt apology on her social media accounts, saying that she was thankful no one was hurt, and that it was never her intention but she understood why she was defaulted. She received no prize money or ranking points for her performance.